A local San Jose grocery store is under investigation after a customer witnessed raw meat being transported in Costco shopping carts. Anoushah Rasta reports. Read our follow-up story about a 2016 photo that captured raw meat in shopping carts being rolled into another San Jose grocery store. A local San Jose grocery store is under investigation after a customer witnessed raw meat being transported in shopping carts. Loretta Seto happened to be on a routine shopping trip at 99 Ranch Market, a grocery store at Hostetter Road and Lundy Avenue in San Jose, hoping to pick up a few things for a weekend barbecue when she spotted two men delivering raw meat in Costco shopping carts at the front entrance. She says her initial reaction was to take photos of the incident which she later posted to Facebook as a warning to other shoppers. "Raw meat was being transported in Costco shopping carts − first thing I did was snap a photo," Seto told NBC Bay Area. "Two guys were transporting slabs of pork — they were just slapped on the handle bard. I don't know where it goes — does it go down the aisle and touch all the products? I don't know. It was absolutely horrific in my opinion." Seto's post now has well over a thousand shares. “Talk about disgusting! I’m usually okay with sticking the kids in the seat of the basket, but this is a whole new level of gross. Beware,” Seto said in her Facebook post. Since Seto posted the photos to Facebook, the Santa Clara Department of Environmental Health confirmed they are now investigating how slabs of raw meat were delivered to 99 Ranch Market. The post didn't just catch the attention of the city's Department of Environmental Health, but it also sparked a conversation on the unsanitary methods the meat vendor used to transport the meat. In an interview with NBC Bay Area, 99 Ranch Market said they learned about the incident on Friday and have dumped all the meat from the vendor, Jim's Farm Meat. 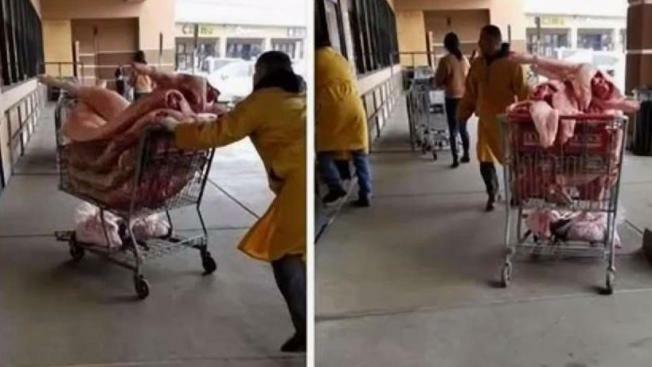 Photos of raw meat being transported in Costco shopping carts at a local San Jose grocery store, 99 Ranch Market, went viral after a woman witnessed the incident. A spokesperson from the meat vendor, Jim's Farm Meat, confirmed to the Modesto Bee that the employees seen pushing the carts into the store have been fired. "We are thoroughly investigating the incident," said spokesperson Maria Moon. "This isn't anything we typically do. When we send our products out, they are always in a combo bin and wrapped. That's how it left our facility." Moon declined to comment further on the matter until the investigation is complete but she did explain that the actions of the now-fired employees is not something the company approves of. NBC Bay Area has reached out to Costco for comment about the use of their shopping carts for deliveries in other stores.